Ahead of the Ginetta GT 5 Challenge race weekend at Silverstone during the June 8 weekend, racer Charlie Martin sat down in front of a crowd at the drivers’ meeting. With a rainbow sticker in hand, she explained a rather simple—but effective—plan: place one of these small stickers somewhere on your car to show your support for the LGBTQ+ community during Pride Month. Show that you’re willing to make racing a more inclusive space for everybody. Easy. Except, it wasn’t. It’s rare to see anyone in motorsport have such open displays of support the LGBTQ+ cause. Martin was placing herself in the hands of a male-dominated field with the hope that they would accept her and the many others who have worried about fitting in. There was always the chance that none of the drivers would take a sticker from her as they walked out of the meeting. There was always the chance that this plan would flop. Martin decked out and ready to race. But despite the inevitable anxiety, it didn’t. Martin had created a roll of rainbow vinyl and cut out all 130 stickers on her own. That had seemed a lofty number at the start of the weekend. But by the end—after race officials asked to put them on the pace car and the safety car, after fans requested them in the paddock—Martin realized she could have made twice as many, easily. It was an encouraging moment for Martin, who did something that most racers don’t ever do. She began the process of gender transition in the midst of her career in order to feel more at home in her body. It’s not an easy decision, nor is it an easy process. Transitioning can get pretty expensive, depending on the level of transformation that each person desires. Financially supporting a racing career while also undergoing that process can be difficult. Throw into that the intensely hetero-masculine atmosphere of racing, and, well… that just gets a little scary. The road to racing is never an easy path for anyone, but there have been some unique challenges for Martin. Martin fell in love with being immersed in racing. A childhood friend’s father was a club racer, and she would tag along on weekends of camping and speed. The nature of club racing meant that she was entrenched in the sights, sounds, and smells of cars close up. Being a part of the action and not just a spectator brought the elitism of racing down to a slightly more achievable level. But it took until that childhood friend started racing himself for Martin to realize that this is something she could do, too. After graduating from university, she worked a summer job to purchase her first car, with some help from her mom. The next year was dedicated to putting her Peugeot 2.5 back together before it was ready to hit the road. Her path took her to hillclimbing in her home country, England. The series was as friendly as it was cheap and proved a perfect venue for an inexperienced racer to come into her own. After three years, she was able to upgrade her car to a quicker rear wheel drive one, and it helped to springboard her career forward. All photos courtesy of Naomi Panter. Which inspired her to start competing in FIA-sanctioned hillclimb events in France, which is when things started to get difficult. Martin came from a pretty average family who, despite their emotional support, weren’t able to fund her career. She was responsible for drumming up her own money, and local support was tough to come by when she started competing internationally. Any fans or sponsors she gained were hard-earned; Martin was running the show, finding fans on social media and looking for sponsorship wherever she could find it. She was sleeping in a van that she had converted into her own camper, complete with a bed and a shower. The hard work paid off. Hillclimbing was an incredible experience, but Martin wanted to see what circuit racing was all about. She dipped her toe in the water with a Mini before leaping into a three-hour endurance race a Le Mans. Which brings her to 2018. This year, Martin is competing in the Ginetta GT5 Challenge, a well-known series in England that supports the British GT and British Touring Car Championships. It’s been a great opportunity for her to get exposure in her home country, especially since races are often aired live. And with podiums in the first three races, Martin is proving that she knows her way around a race car. But to just recount her career highlights would be to neglect the matrix of experiences that Martin underwent during her rise up the motorsport ladder, which includes her transition. With such an intimidating future before her, Martin started thinking that it might just be easier to stop racing. If she sold her car and trailer, she could put the money toward surgery. She could then ease into another path of life as a woman without having to face any potential backlash she could get in the racing world—something that could twist her love of racing into fear and discomfort. But racing is her passion. Her livelihood. And, thankfully, her family and friends were supportive and told her to take the time to think about it, to fully understand that Charlie Martin could be both a woman and a racer. Martin decided to take the whole year of 2012 off of racing during her transition. Coping with the stress of a season as well as the mental and physical toll that the process exacts would have been just too much, but it did provide an opportunity for Martin to work on reinventing her presence in the paddock. She emailed some friends and told them what was going on, asking them to spread the word so that her eventual return wouldn’t come as a massive shock. And by that September, Martin turned up at a race as a spectator. “A lot of people didn’t know who I was, didn’t know what was going on, didn’t even made the connection that it was me,” Martin said. “It was really, really hard. So, she didn’t quit racing. She kept her car and her trailer, and Martin returned the next season to keep honing her skills behind the wheel. At the end of that year, she had reconstructive facial surgery, the last bit of her physical transformation, which made a big difference in how she was received. She was no longer subject to potential misgenderings, and people recognized her as the woman she is. That made life so much simpler for Martin, and her confidence in herself and her chosen career began to grow. Her transition and subsequent return to racing empowered Martin where she had once worried that her racing life and her female self may not mix. It’s a motto that had stuck with her throughout her transition. In the midst of one of the most challenging period of her life, Martin found strength in the little things. One of them being a phrase she spotted: your mountain is waiting, so get on your way. It seemed to speak to the essence of her very self. Living in England and traveling to France for twelve events a year seemed absurd. It seemed impossible. But it was the push that Martin’s career needed, and it actually seemed to be a real possibility, if she really thought about it. So she got her car ready and set out to make her full time return to racing. She showed up in France entirely on her own with nothing but her car and her converted motorhome—and absolutely destroyed the competition with a three second margin that secured her confidence. This is where I’m meant to be. Above all else, Martin sees herself as a racer. When she puts her helmet on and gets behind the wheel, she’s just like any other person on the starting field. But she also recognizes the importance of telling her story. She recognizes the role she can play as a gay trans woman and an LGBTQ+ advocate in a traditionally heterosexual, cisgender, male-dominated field. Recently, Martin has begun working with the charity Stonewall and hopes the see the relationship there flourish. “In a position where you’re visible publicly and doing things to get exposure, if you can promote a positive message, then that’s a great opportunity to do so,” Martin says in tandem with her activism. 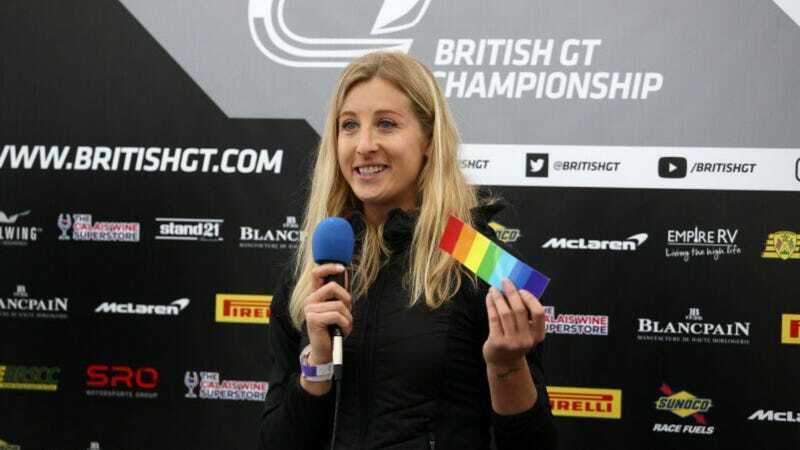 It’s the same with any other driver—she hopes that if more big names in the sport genuinely speak out in support of the LGBTQ+ community, then we can start seeing a big change in the atmosphere surrounding the motorsport world. A notable example is Lewis Hamilton. While he’s a great role model for people of color, he also caught a lot of flack over Christmas for telling his nephew that wearing a dress is wrong. Had he transformed that into a positive message rather than a negative one, it could have been a great way for one of the most recognizable people in racing to stand in solidarity with the LGBTQ+ community. Think, instead, of racer Danny Watts. While he didn’t come out as gay while actively competing, Watts’ well-respected role in the world of motorsport and the incredible outpouring of support that followed showed that the racing community is changing. Being an LGBTQ+ person in a traditionally male, heteronormative environment is no longer quite the taboo that it once was. Even the simple act of wishing the best for Danny Watts opens up the possibility of inclusivity for racers, fans, and more. After all, Martin emphasizes that the LGBTQ+ community is for everyone. Essentially, it’s not just the duty of members of the LGBTQ+ community to represent themselves. It’s up to all of us—fans and drivers, gay and straight, transgender and cisgender alike—to work together to ensure that the racing community is a welcoming place for everyone. After all, our passion is the reason why we’re all here. That’s why Martin is taking the first steps. Such open displays of acceptance and inclusivity are rare in racing—and Martin broke the barrier with something as simple but wonderfully effective as her pride stickers. For her, it’s only the beginning. It should only be the beginning for the rest of us, too. This is only the beginning for Charlie Martin. Her dreams are big, but her ambition to conquer her goals is even bigger. Her current outing in the Ginetta series is a one-year stepping stone into greater things. Martin hopes that endurance racing is on the horizon, hoping to make her debut at the 24 Hours of Le Mans within five years. But activism goes hand-in-hand with racing for Martin. She hopes her relationship with Stonewall will blossom into an ongoing project to reach a wider audience. In the meantime, she still plans on promoting awareness and positivity for trans folks and the LGBTQ+ community at large while also exploring a career in TV presenting to help create visibility as well as to indulge in something she loves. Her mountain is waiting, and she’s well on her way.